After 4 days of poor weather, Wednesday's forecast promised a return to mostly sunny skies for the foreseeable future. A morning glance at the Paradise webcams showed sunshine and blue skies, so that seemed like a good destination after several trips to Mount Baker during the past few weeks. 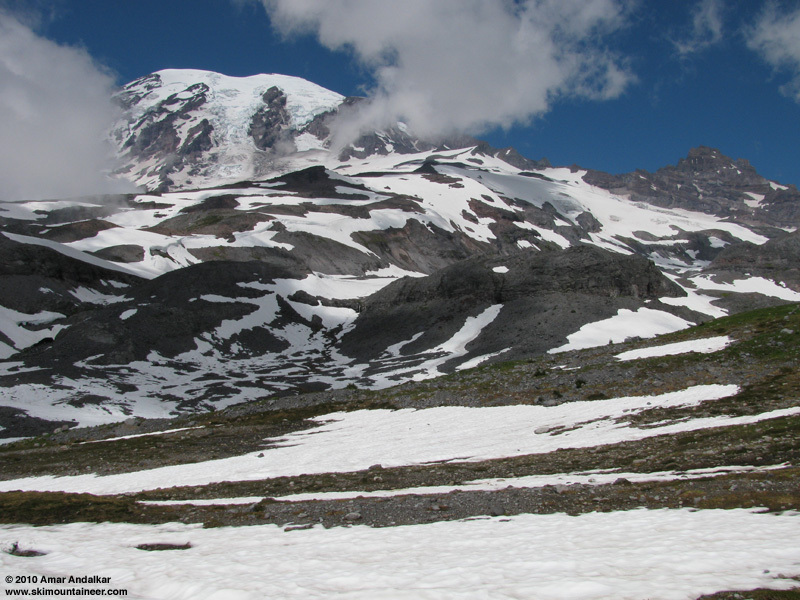 Since my last trip to Paradise Glacier 3 weeks ago when one could still skin continuously from the 4th Crossing trailhead to Camp Muir (see TR), I expected that things would have melted out quite a ways and that a few miles of walking would now be needed to get to snow. Got a very late start and headed up from 4th Crossing just before 1pm, with skies now partly-to-mostly cloudy at mid elevations, but still blue and clear on the upper Mountain. Quite a few mosquitos at the trailhead, but none seen above 6000 ft. As expected, the Skyline Trail was now bare past the Stevens-Van Trump monument at 6050 ft, but it looked like skiable patches could still be connected back to nearly this point on the way back. Looking north from the Paradise Glacier Trail. I stayed on the Paradise Glacier Trail and hit continuous skinnable snow around 6250 ft, just 40 minutes and under 2 miles from the car. The snow in the basin up to 7000 ft is actually slightly smoother now than 3 weeks ago, the recent cloudy weather has dulled and flattened the suncups and runnels somewhat. The snow near the toe of the Paradise Glacier at 7000 ft is now barely continuous if you go directly up the steep face, but a more solidly continuous path appears to be possible (with proper routefinding) if you go farther east and skin up the gentler access to the glacier. The Paradise Glacier itself remains in good shape, with a fairly-smooth moderately-dimpled surface, and only a few easily-avoidable cracks continuing to open. A few sections of bare ice are showing near the toe, but none elsewhere. The top of Paradise Glacier near 9000 ft -- the only snow connecting to Muir is the steep finger at upper right. 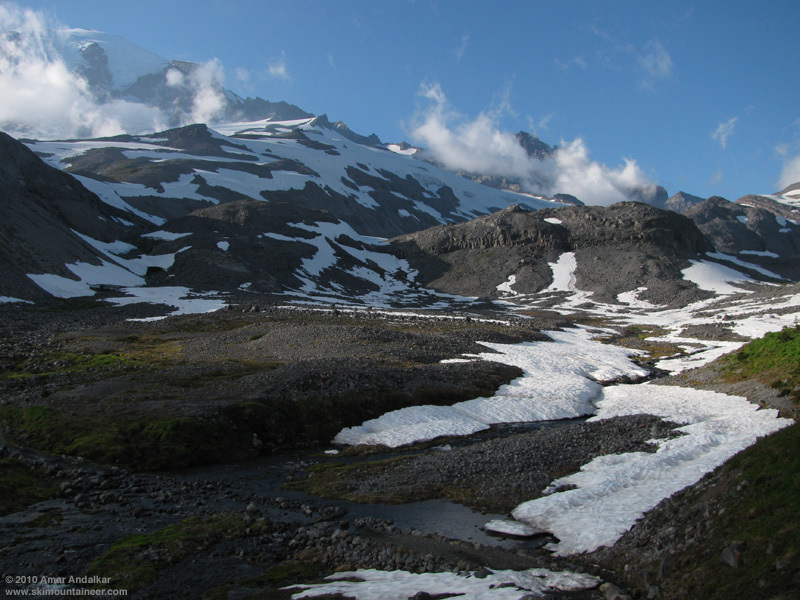 The smooth snow ends near 9000 ft at the top of Paradise Glacier, with a rough surface of old raised ski tracks and large suncups above that. Only a thin chute of continuous snow still connects to the Muir Snowfield, but this follows the steep face directly below Anvil Rock and it required some extreme skinning in order to keep the skis on my feet and off my pack. Luckily the snow was well-softened by mid-afternoon and the sun was shining on this section, making the steep and deeply-suncupped chute barely skinnable. 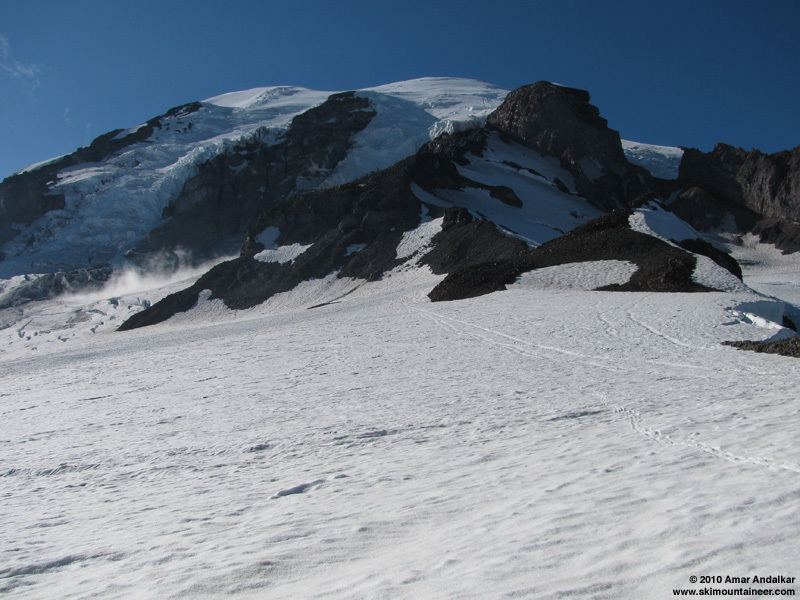 Angled left above the chute to join the bootpack on the Snowfield, and followed that up to Camp Muir by 4:45pm. Still quite busy up there, climbing season continues in full swing, but ski season appears to be over: the upper portion of the Snowfield was a mess of irregular suncups large and small, and not surprisingly, there were no recent ski tracks visible anywhere and I was the only skier in sight. The section of smoother snow from 9700-9500 ft on the Muir Snowfield, with the field of suncups at left in the distance. Skied down at 5:15pm, just as a few wispy clouds began to drift past the Camp. The suncupped snow down to 9000 ft skied much better than expected, especially a short smoother portion from 9700-9500 ft located well east of the main bootpack, but mostly it's not what anyone would call great skiing. Below 9000 ft, with a proper choice of ski line (avoiding old raised tracks) the skiing was really good, with smooth and fast corn. Sweet skiing carving big GS turns past a large group with several tents camped on an island of rock in the middle of the glacier. Unfortunately I was also carving up ice worms in untold quantities, as by this late hour they were out on the glacier's surface by the hundreds per square foot. Turns down the heart of Paradise Glacier near 8000 ft.
Nice turns continued all the way down the steep face at the toe of the glacier, with the snow softened enough to allow easy carving through the minor bumpiness of the surface. Skied all the way out to the Skyline Trail at 6000 ft beside the Paradise River, continuous except for a single 50-ft long carry near 6200 ft. An easy 20 minute hike brought me back to the car before 7pm. Nice way to spend the afternoon, 4900 ft of gain for just over 4000 vert of mostly good summer skiing. Skied out to the Skyline Trail on that finger of snow. 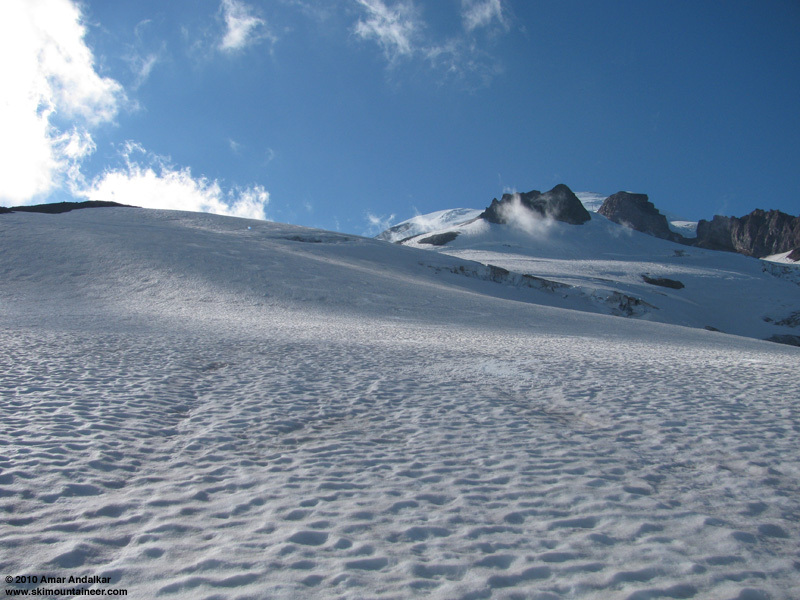 Overall, the Paradise Glacier is in great shape for mid-August, and should stay that way for a while unless the upcoming heat wave brings some rapid changes. 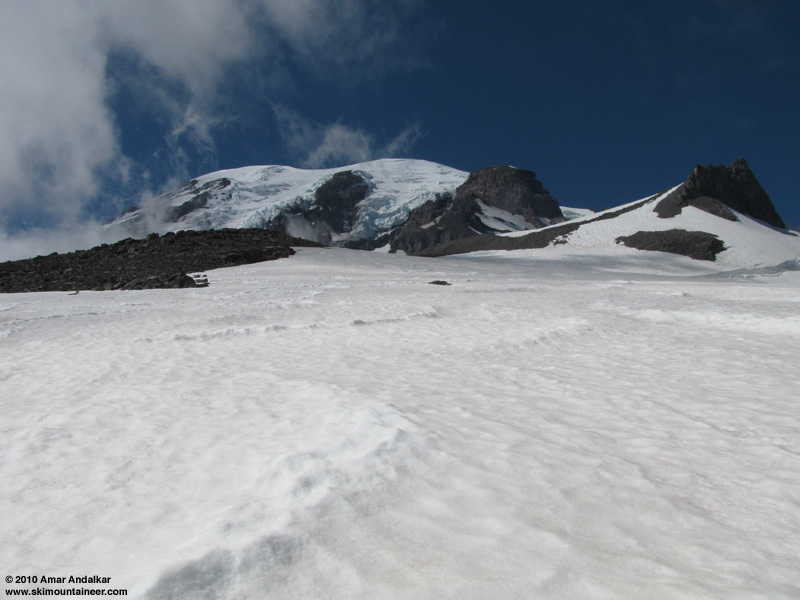 The snow is not quite as good or smooth as the Squak Glacier on Baker was a few days earlier (see TR), but it is a much easier trip with less than half the approach on foot to reach continuous snow, and Paradise Glacier has far less objective hazard from crevasses than does the Squak. However, the continuation above 9000 ft up to Muir is only worth it for the views and whatever else, not the skiing right now. 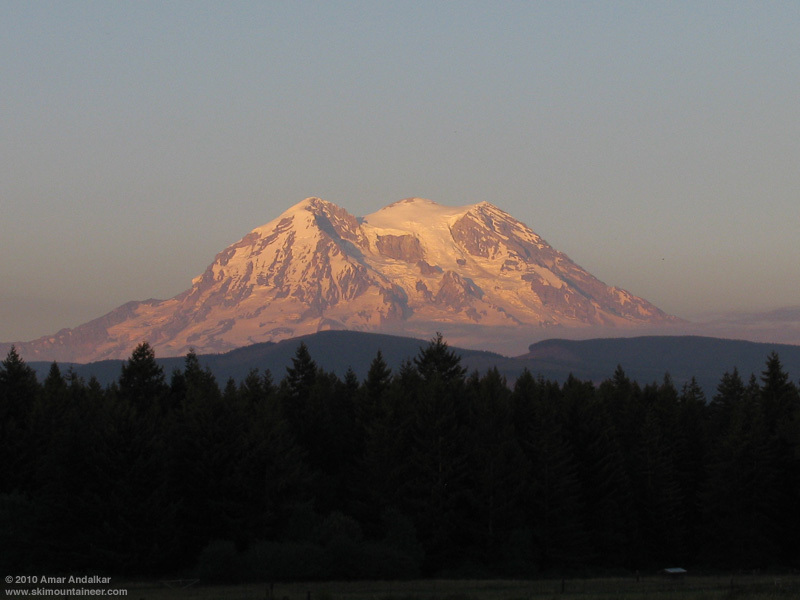 The three summits of the Mountain, aglow at sunset on the drive home. SYNOPSIS...HIGH PRESSURE WILL BUILD IN FROM THE WEST BRINGING A WARMING TREND OVER THE SEVERAL DAYS. THE LOW LEVEL FLOW WILL GO OFFSHORE ON FRIDAY AND REMAIN OFFSHORE THROUGH THE WEEKEND PUSHING HIGH TEMPERATURES AS MUCH AS 20 DEGREES ABOVE NORMAL. THE HIGH WILL SLOWLY WEAKEN NEXT WEEK RESULTING IN A COOLING TREND. WEDNESDAY...MOSTLY CLOUDY IN THE MORNING. MOSTLY SUNNY IN THE AFTERNOON. FREEZING LEVEL 10500 FEET. WEDNESDAY NIGHT...PARTLY CLOUDY. FREEZING LEVEL 12500 FEET. THURSDAY...SUNNY. FREEZING LEVEL 14000 FEET. THURSDAY NIGHT...MOSTLY CLEAR. FREEZING LEVEL ABOVE 15000 FEET. FRIDAY...SUNNY. FREEZING LEVEL ABOVE 15000 FEET. FRIDAY NIGHT...MOSTLY CLEAR. FREEZING LEVEL ABOVE 15000 FEET. SATURDAY THROUGH MONDAY...CLEAR. FREEZING LEVEL ABOVE 15000 FEET. MONDAY NIGHT AND TUESDAY...PARTLY CLOUDY. FREEZING LEVEL 15000 FEET. Thanks for the update! From the first pic it looks like the McClure route is broken up. As usual, Turns All Year gives me the best information available for August hikes around the Paradise Glacier. Thanks, Amar. The pics from your 8-11 trip to Muir are particularly useful (I'm heading up the 'back way' to Anvil Rock) and your descriptions of conditions just get better and better. - still gettin some turns down here on Lassen. the summer-trail that attains the ridge (half-way) has a good piece of snow. it's about 400 vert w/ a good, low-angle runout. * it's quite a coincidence, that Rainier and Lassen are the active volcanoes in the U.S.